FOO FIGHTERS came to Richmond, Virginia last night (Wednesday, September 17) and played a crowdfunded concert at a 1,500-person venue called the National, with frontman Dave Grohl taking a moment during the 23-song set to pay tribute to local artist and late GWAR leader Dave Brockie. The show itself was the FOOs' first in Richmond in 16 years and was the brainchild of a handful of local fans who sold $70,000 worth of tickets in the hope that it would persuade the band to come to town. Local businesses got into the act, buying thousands of dollars' worth of tickets and giving them away, and the mayor even declared the 17th "Foo Fighters Day" in Richmond. Grohl was born 100 miles north in the town of Springfield, Virginia. His mother was in attendance at the show. 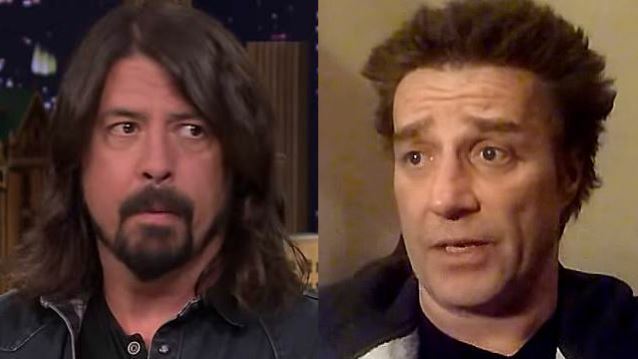 Grohl paid tribute to the late Brockie, who died in March at the age of 50, by recalling, "One of the greatest compliments I’ve gotten in my life…. They asked Brockie about a Grammy nomination and he somehow made his way to me and said, 'Dave Grohl has actually had teeth removed so he could fit more Grammy dicks in his mouth.'" According to The Pulse Of Radio, the FOOs' set list consisted mostly of hits and fan favorites from across the group's 20-year career. The band did not preview any material from its upcoming eighth album, "Sonic Highways", which arrives on November 10.